Love getting lost in Amsterdam and finding fantastic places by accident. We came out of Kadinsky in a daze, walked a bit looking for the Droog showroom and somehow walked right into this magic, magic place where people were lining up for chocolate. 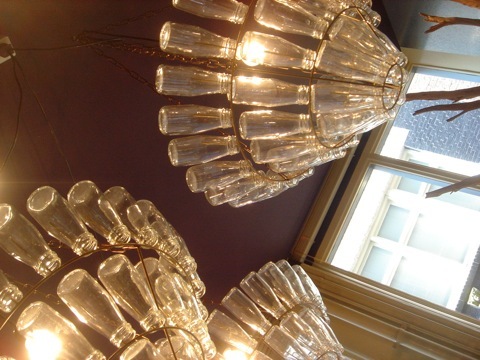 The first things that caught my eye were the milk bottle chandeliers. And then, the scent of deliciousness: chocolate! Without thinking, we got in line and soon were feasting in delicious, hand made, sugar free, 70% cocoa, natural flavors, out of this world chocolate. The only problem is, it ruins chocolate for you. 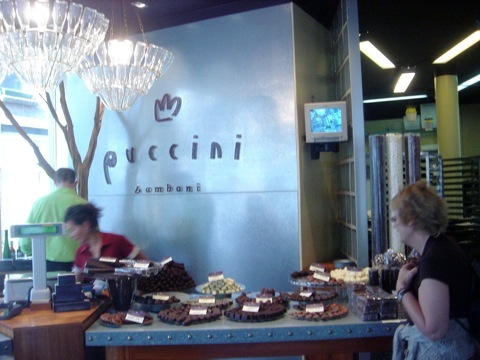 Any other chocolate is mediocre in comparison to Puccini. One bite and you instantly become a chocolate snob. It’s THAT good. If you go to Amsterdam, make sure to try their fig-marzipan bonbons...and who would have thought that lemongrass chocolate would taste so good? Check them out at two addresses: Staalstraat 17 and Singel 184.